I brought the 10-pound monster of a pizza on my flight back to Los Angeles and threw it in my fridge for the next day.The box came with instructions on how to bake the second half of the pizza, and I followed perfectly (although it wound up needing five minutes more than the recommended twenty). Chicago-style pizza is unique in that all of the toppings are baked inside and can’t be seen until you start eating. This can pose a bit of a problem, because if the restaurant accidentally slips some vegetables between the folds, it’s already too late. It’s a high risk/reward ratio, but it pays off big time. After a two-day wait, my long-distance pizza was finally ready. I took the risk, and it sure paid off. The pizza was a cheesey, doughy, saucey, pepperoni-ey taste-tacular. It was actually almost as good as if Giordano’s had completely cooked it. After two slices, I was stuffed and left the rest for the vultures (read: friends). The only downside of Giordano’s is the price. The medium cost me a little over $20, but it was a small price to pay for the perfect pizza to feed four people. 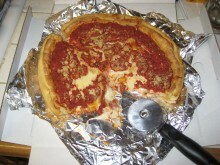 Incredibly, Giordano’s can actually be delivered anywhere in the country. Order yours here.